Yes, another year is rolling on by. Somewhere along life, you get to the point where you stop looking forward to birthdays and they just become another day. I'm not sure exactly when this happens. Am I there yet? Nope. I still get excited for July 23rd like it was Christmas. If anyone likes to throw a party, it's definitely me! But this year, when Ty asked me what I wanted to do for my birthday, I considered throwing a 1970-themed party with all the retro decor. I envisioned dressing up in a swanky party frock to serve martinis by the lava lamp. But then I thought about how I just got through a wedding, a few holiday cookouts and a honeymoon on the way and I was immediately exhausted from hosting. I put that on my running list for upcoming parties. Instead, I thought it would be pretty fun if we did something different. 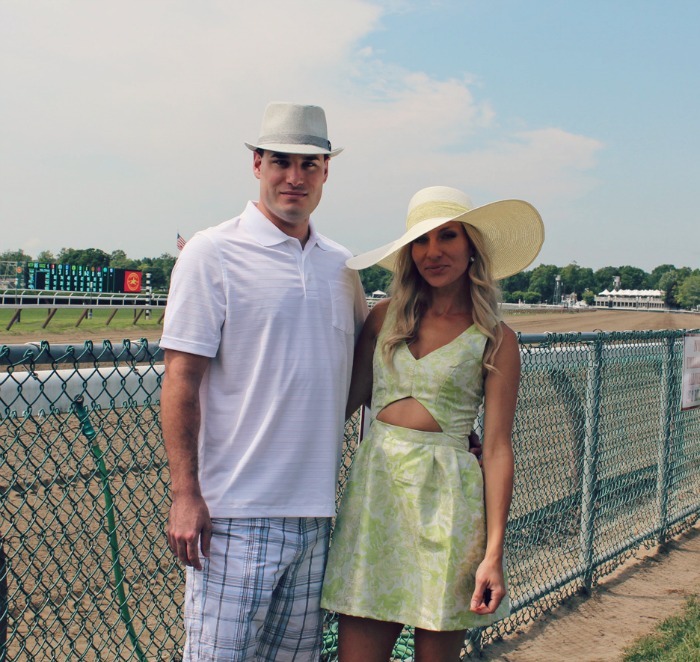 Like dressing up in derby dresses & hats and going to the Saratoga Springs Horse Races. So this is what we did this weekend. Of course, Sunday morning I woke up with an achy body, chills and a headache. How lovely. 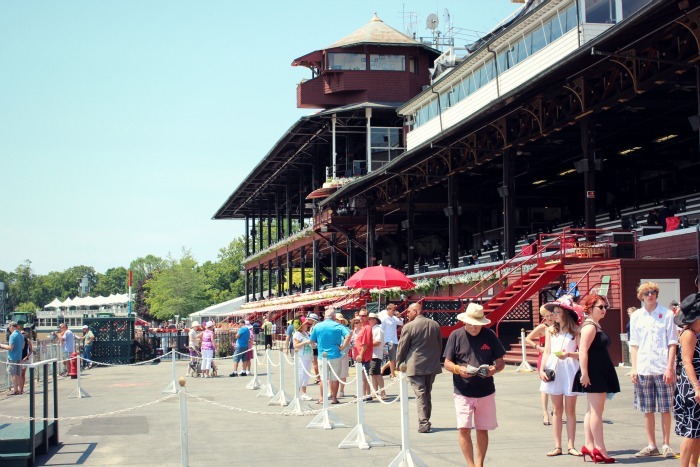 I took a couple ibuprofen and put on my sun hat 'cause sick or not, I was going to the races! My younger sister, her fiancé and a couple other friends came to celebrate with us. Ty & my sister's fiancé, Peter got up at the crack of dawn just to go get us front row seating at the race track. And by front row, I mean we were sitting as close to the track as you can get. We have been having a heat wave here over the last week or so. 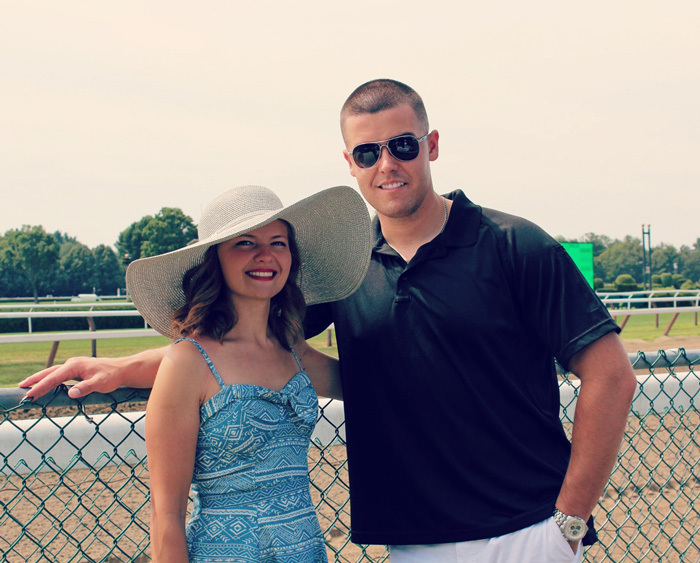 The weather cooled down a bit (78 degrees) just in time for us to spend the day in the sun at the races. I am not the best gambler. Rather, I don't like gambling much. 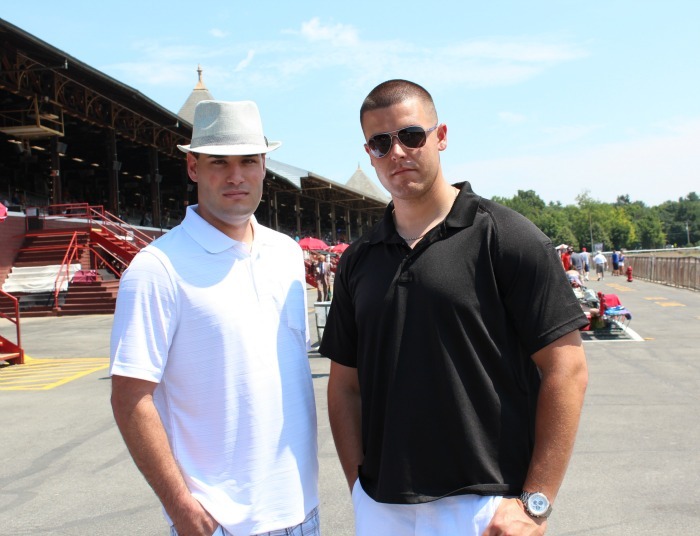 I was more excited for the experience of going to the races. 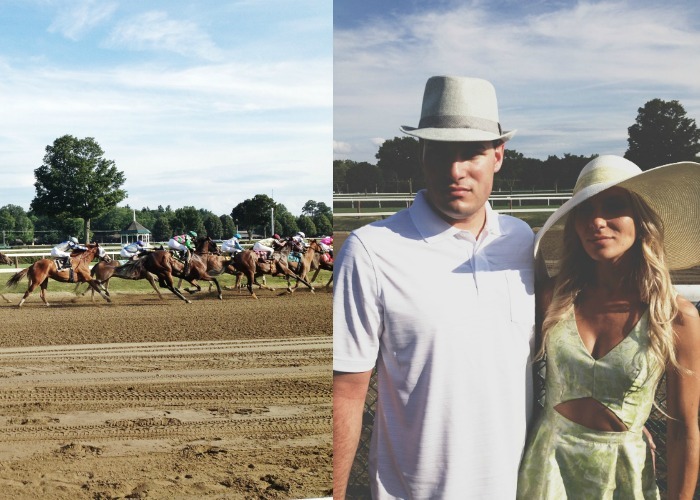 The big hats everywhere, thoroughbreds racing by... the sound of people cheering as they win. Some people are pretty intense about betting and rightfully so when they are betting thousands of dollars! I'm not that into it. 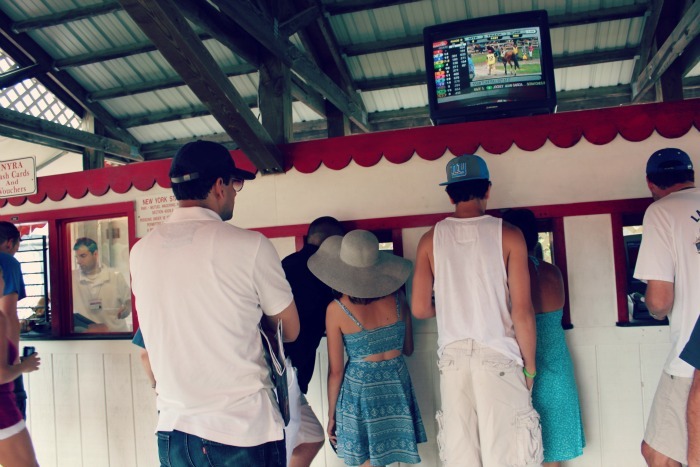 As we approached one of the hundreds of betting stations, we were a little overwhelmed with our options and who to bet on. A little old man sat in his chair not far from us, with a "Can I Help You?" sign sitting above his head. He obviously saw us looking confused and came over to give us a little guidance. As he explained the odds, betting procedures, etc to us, I couldn't help but think about his story. I often do this when I meet new people. I wonder who they are, what life they lived and how they got to where they are now. I'm sure he had been working at that track for years. Maybe even owned a horse or two. You could tell by the way he spoke about things that this race track had been a big part of his life. He must have seen plenty of men cry there as they lost a fortune, many people celebrate over a win and everything in between. He gave us some great advice, he said, "The horses don't know the odds." What a wise old man he is. And so, my betting strategy came into place after I heard that. I pick the horse name that I like the best. Simple as that. Ha! Thug Daddy, Isn't She Wonderful & Double Gold just to name a few. And that little old man was right. 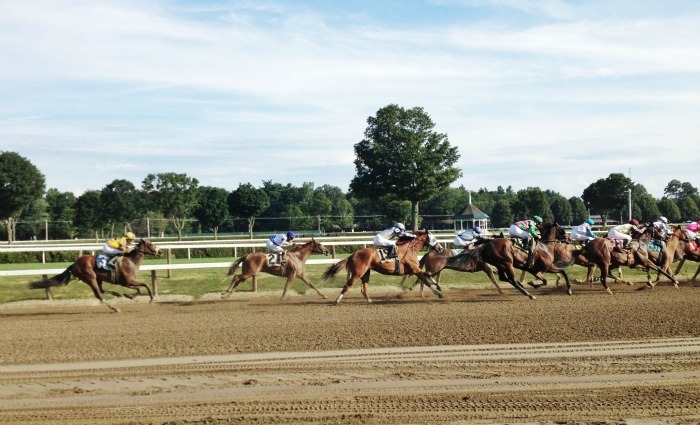 Last race of the day, we put our money on #6. He was clearly not a favorite and not expected to win at all. But that horse won with odds of 68-1. A few people went home pretty happy after that. It was fun to spend time with friends and just do something different. The experience definitely left an impression on me and needless to say, tonight's movie will probably be SeaBiscuit or Secretariat. Hope you all had a wonderful weekend, too!! Looks like a great time, you look beautiful. As well as your sister to!!!! Happy BIRTHDAY MY DEAR Friend!!!! Yes, she is his twin for sure!